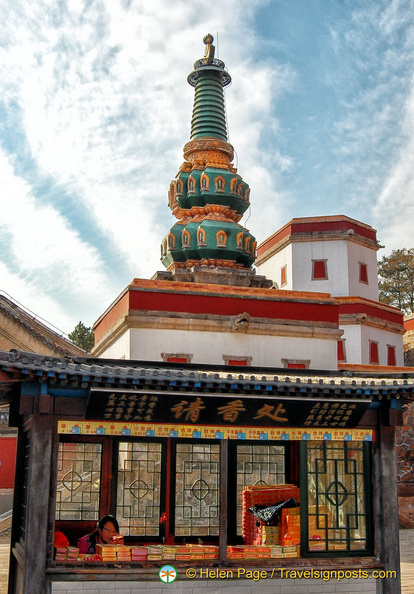 Puning Temple, located to the north-east of the Chengde Mountain Resort, is one of the temples that make up the Eight Outer Temples complex. Nicknamed the “Big Buddha Temple”, it is one of the more interesting temples in the complex as it is home to the world’s largest wooden sculpture of the Bodhisattva Avalokiteśvara, the Buddha of Compassion, whom the Chinese refer to as Guanyin. When the Emperor Qianlong conquered the warring Dzungar tribes and other ethnic minority groups in the north-west of China in 1755, he ordered the building of the Puning Temple as a symbol of his desire to maintain peace among the various groups in the region – the word Puning means Universal Peace. 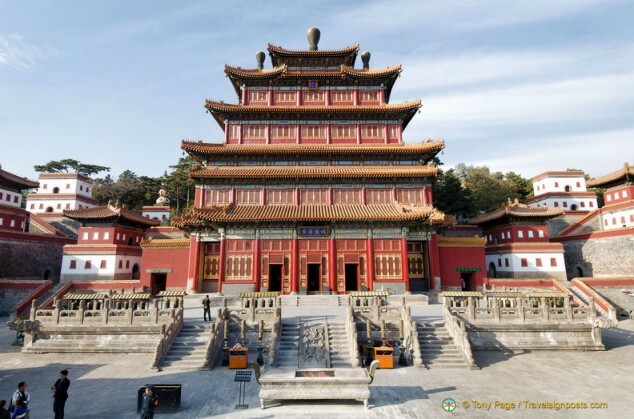 The temple was designed as a replica of the Samyai Monastery in Tibet and its architecture is a combination of Han and Tibetan styles. This was meant to signify the harmony between the Chinese rulers and the minority populations. 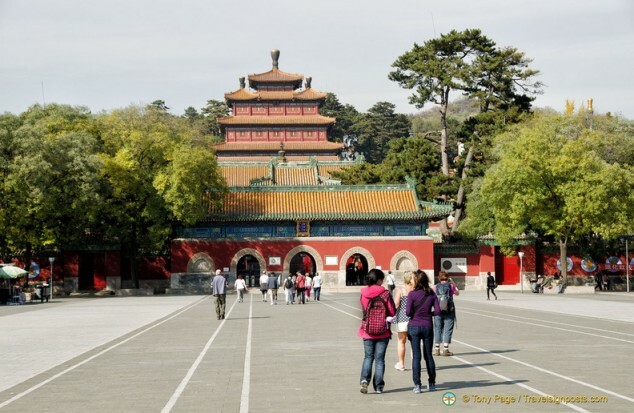 Within the 23,000 square-metre complex there are numerous religious buildings, including eight temples, the Gate Hall, the Bell and Drum Towers, a Stele Pavilion, and the Hall of Heavenly Kings. 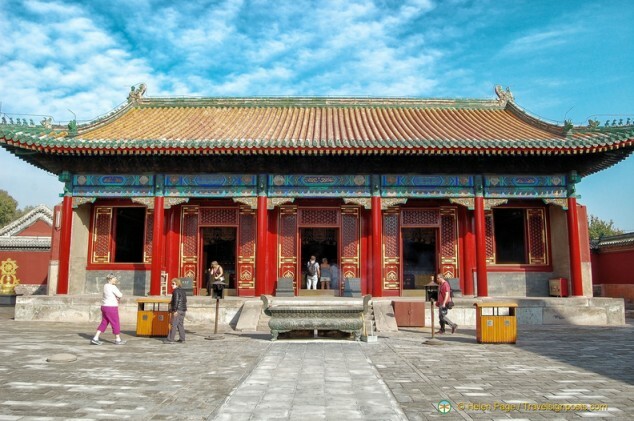 The entrance to the Puning Temple and the front gate halls and buildings are of traditional Han temple style. 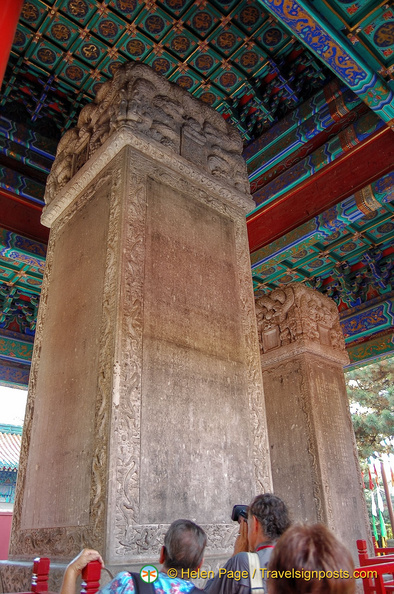 The Stele Pavilion has an inscription by Emperor Qianlong. Called the Puning Sibei, the stele of 1755 commemorates the founding of the temple and the conquering of the Dzungars. 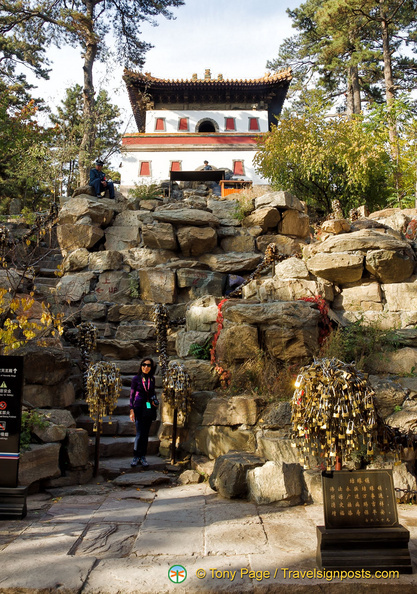 The front section of the Puning Temple has many colourful temple buildings, prayer wheels and other features and Buddhist symbols to admire. However, the purpose of our visit is to see the Bodhisattva Avalokiteśvara. 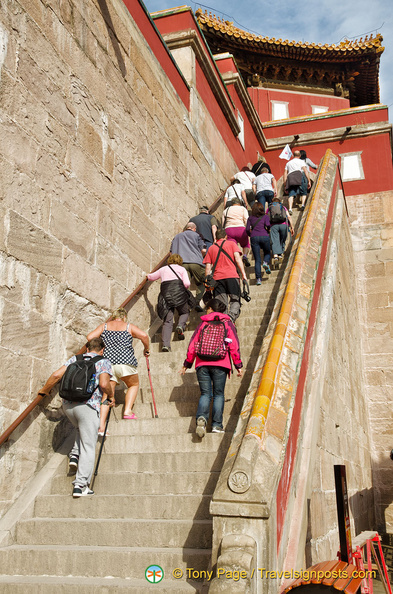 We climb the 42 steps to arrive at the rear Tibetan section of the temple where the Hall of Mahayana is. 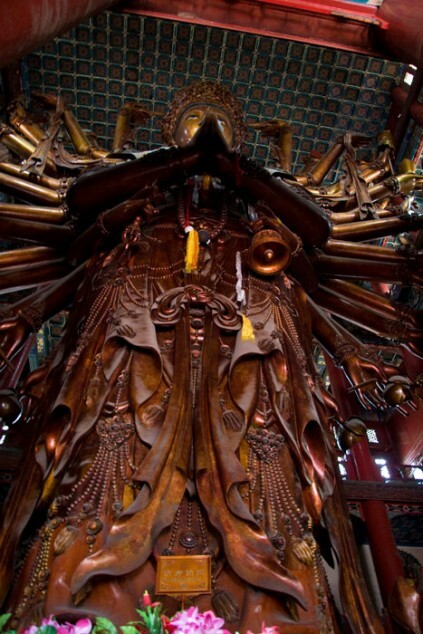 Inside the main Hall of Mahayana is the huge and impressive copper-hued wooden sculpture of Guanyin. Measuring more than 22 metres high, it reaches to the roof of the hall and you have to crane your neck to look all the way up. It used to be possible to climb the three levels of interior galleries to take a closer look at the features of the sculpture and the face of Guanyin, but disappointingly for us, the entrance to the galleries is closed. Another disappointment for us is that photography is not allowed of the buddhas and lamas and so we don’t have any photos of our own to share with you. I’ve included the above image from Wikipedia to give an idea of what this impressive statue looks like. In a way, I was disappointed that the Bodhisattva Avalokiteśvara sculpture is so tightly enclosed in the dark hall as I had somehow imagined that it would be in a more open courtyard-type location. But given the need to protect the wood, I suppose it has to be enclosed. There are many beautiful temple features to admire in the Tibetan section, such as the roof decorations and colourful lama pagodas. Before leaving, we climbed to the top of a white pavilion where people go to ask for wishes to be granted. 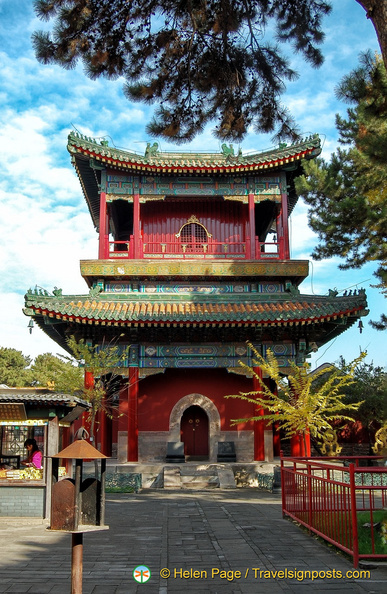 This pavilion is in front of the Heavenly King of Wealth Hall. From the top you also have a good view of the Puning Temple complex. As you can see, the “love locks” that are so prevalent in Europe, have found their way here. Only difference is that these are intended as prayer locks – you engrave your name on the lock and place it around the temple complex for good fortune, good health etc. And don’t worry if you didn’t bring your own lock. This man has various types of prayer locks for sale. 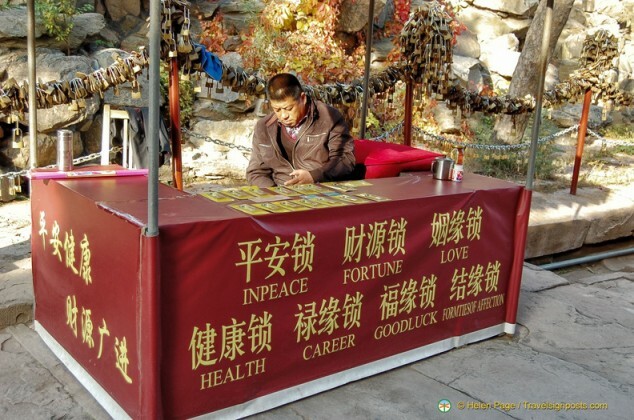 Looking at the number of locks around the temple, it looks like his fortune is pretty good. 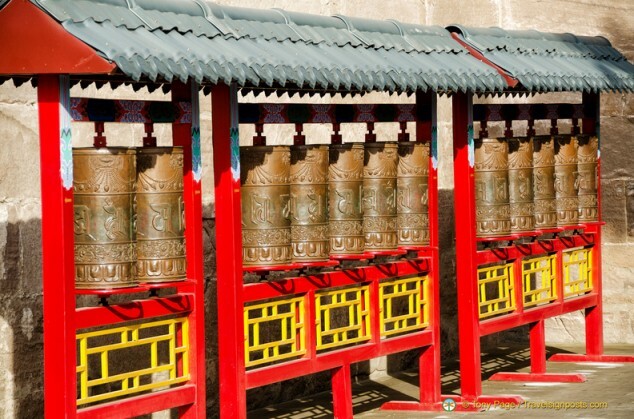 From the Puning Temple you can stroll over to the Puyou Temple to see the collection of arhats and also enjoy some shopping at the Puning Street Qing market. You can see more Puning Temple photos Here.